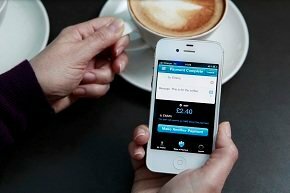 Over 120,000 people have downloaded Barclays Bank’s Pingit mobile banking application within five days of its release. Following heavy demand, Barclays reduced the minimum age for users, from 18 down to 16. Barclays said the reduction of the minimum age was in reaction to younger people calling for access on blogs, app review sites and social media. Pingit, which was developed by Barclays, is available on Apple, Android and Blackberry operating systems. Initially Barclays current account holders can make payments worth between £1 and £300 to people in their mobile contact list. All current account holders in the UK can register to receive payments. But soon any UK current account holder, regardless of their bank, will be able to register. The app links a bank account with a mobile number and means users can pay anyone registered to receive payments from their phone without the need to share bank account numbers. It will be sent from registered mobile number to registered mobile number. Users can just click on a contact and go through a simple process of sending money. They will receive confirmation, which they approve, as does the payee. The service uses the faster payments system which clears most payments in seconds. Authentication comes in the form of a user-generated five-digit passcode. The app is hosted in a Barclays private cloud and plugs directly into the core IT infrastructure.